Interested in learning more about Rutgers? Wondering how you can get involved in Jewish life in college? Candle Lighting – 4:24 p.m. Shabbat Ends – 5:24 p.m. 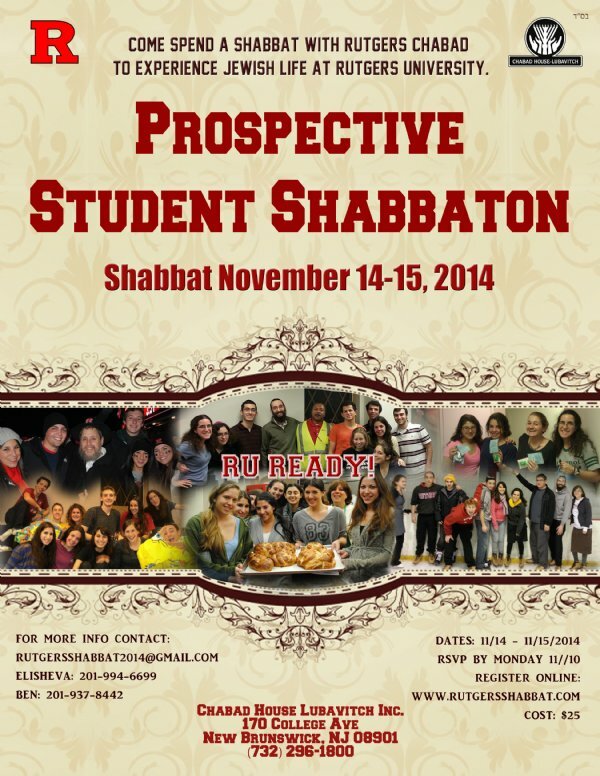 Experience an amazing Shabbat at Chabad House at Rutgers University. Meet other students and tour the College Avenue campus. Enjoy a full schedule of activities throughout Shabbat. Learn all about what Chabad House has to offer Jewish students from every background. Enjoy It All For $25! Limited Space Available. Prime accommodations are on a first come-first serve basis. Register by November 10, 2014. Chabad House is centrally located at Rutgers University’s New Brunswick Campus. Our convenient location on College Avenue puts us in the heart of Rutgers and a short walking distance to all student facilities. This 90,000 square foot state-of-the-art facility features a dormitory that can accommodate up to 72 male students and, separately, up to 37 female students. Each spacious room is air conditioned and features free Wi-Fi and TV cable services. In addition, our delicious meal program offers an extensive menu available to all Rutgers students and accommodates most dietary needs. We offer a full schedule of weekly programs, both social and religious, for Jewish students of all levels. There are weekly interactive religious lectures during which students learn the art of making sushi or challah while partaking in a stimulating and intellectual discourse. These lectures are enjoyable learning experiences which strengthen student’s Jewish identity. Moreover, students learn the essence of Bikur Cholim as they visit patients at the nearby St. Peter’s University Hospital and Robert Wood Johnson Hospital throughout the week including Shabbat. In addition, there are countless daily opportunities for personal growth on all levels of development for all students who walk through our doors. We look forward to personally meeting you on Friday, November 14, 2014!